Valentina Lisitsa is a remarkable pianist, with consistent YouTube video views reaching over 90 million total and with almost 200,000 subscribers. Following her recent, well-received recordings of Glass, Nyman, and the �tudes of Chopin and Schumann, she now turns to the piano works of Scriabin. 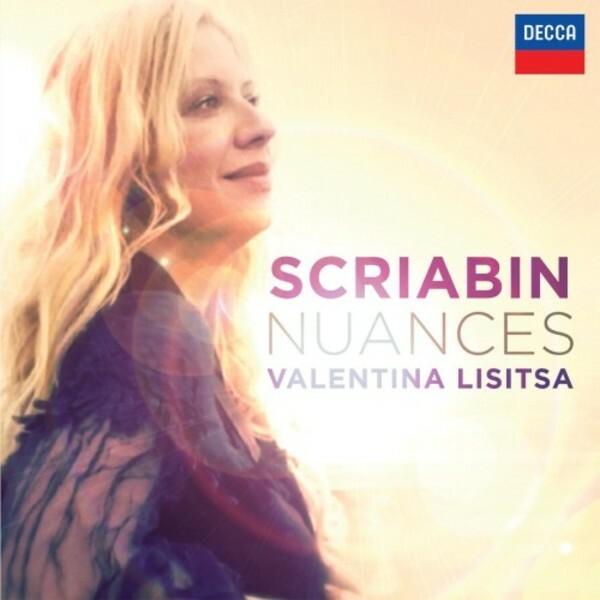 For Scriabin�s 100th anniversary in 2015, Valentina delves into his lesser-known works and finds some beautiful gems. Across a carefully selected range of works for piano, this album showcases Scriabin�s compositions through his lifetime. Consistently a favourite composer among many legendary pianists, Scriabin has in recent years become admired as one of the early 20th century�s most innovative and influential composers. With a highly lyrical and idiosyncratic tonal language inspired by the music of Fr�d�ric Chopin, Scriabin may be considered to be the primary figure among the Russian Symbolist composers. All the works included are recorded for Decca for the very first time - these are revelatory performances from pianist Valentina Lisitsa, a wonderful artist with exceptional musicality and a stunning technique. Valentina Lisitsa�s web presence firmly establishes her as a classical musician of the modern age, with her videos � consistently viewed over 1m times - covering a vast number of works, including the Beethoven Piano Sonatas and well-loved Lizst and Rachmaninov pieces, though to music by Glass and Nyman. An established musician, she has debuted with the Chicago Symphony Orchestra, Seattle Symphony Orchestra, WDR Cologne and many other orchestras. In an innovative and exciting move, her London debut at the Royal Albert Hall (19th June 2012) was recorded and filmed by Decca. Broadcast live online, and released immediately after the event with a following DVD, this ground-breaking release was a bold statement of Valentina�s musical aims, and of Decca�s commitment to enhancing its digital presence worldwide.